It has been a long time since I have dyed my hair. I was quite frustrated with my thesis and final project at university so I don't have many time to coloring my hair again. When holiday coming I think I can have some experience with my hair but I'm sick . I ended up having a lot of dark roots and I think I must to touch up my roots. I bought some palty hair bleach and palty foam raspberry jam hair dye. I've had okay experiences with palty. The only reason why i keep buying it is because i love how easy the application is. It doesn't smell as strong as some other brands and packaging is really kawaii. 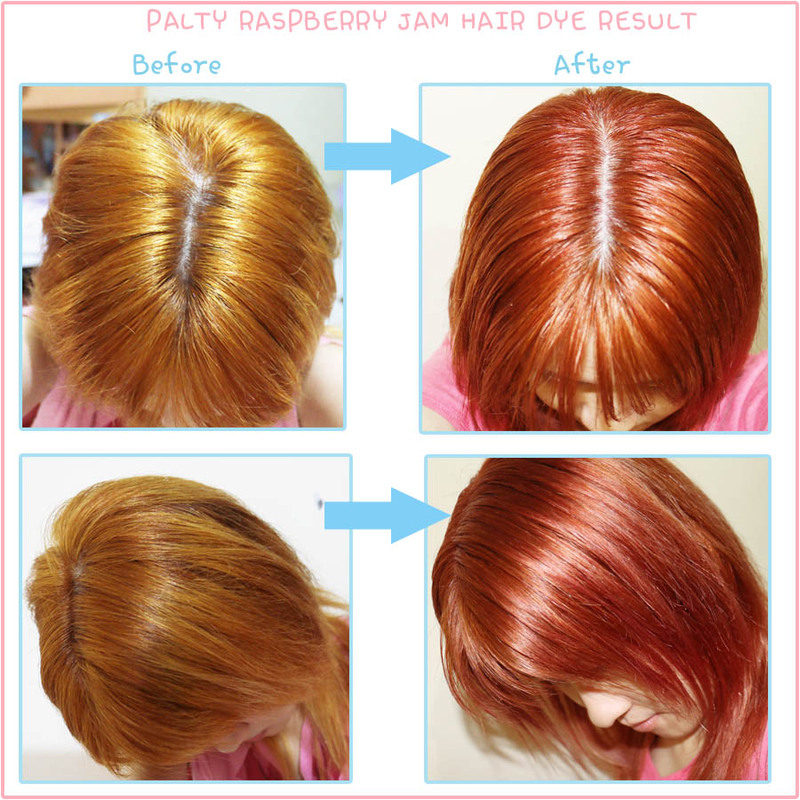 Raspberry Jam is a really pretty reddish brown shape. When you look up the color, especially the little color index images that are supposed to show you the before-after result online you will find images like above . Inside it contains a plastic cup, mixer, cream dye, water solution (developer), conditioner, gloves that actually fit and to my delight , an instruction manual with proper English translation (yay). The box turns into a handy "cup holder" so you don't risk tipping over your product while you mix it . First, pour the developer (labeled #1) into the cup. Mix everything together by drawing circles with the scraper 20-30 times. Make sure to follow the instructions and not just dump the solution onto your head. If you want a nice even color, make sure you apply only to your roots first because the roots take longer to achieve lift . Next you'll want to roughly section your hair and apply the dye one section at a time by scooping small amounts into your hands and rubbing it in lightly. Finish off by massaging your scalp to ensure the dye is distributed evenly. Leave on for 20 minutes then rinse off with warm water and apply the conditioner provided. Palty Hair Dye Result: I think I was able to get as close to the box as I could. I feel it does kinda reflect the box color in certain lighting and looks nice , but under different lightings, my hair can look from orange brown. I would have liked it to have more pinkish/red tones. I've always heard only good reviews about Palty :) Btw how does your hair feel? I'm holding a giveaway on my blog. 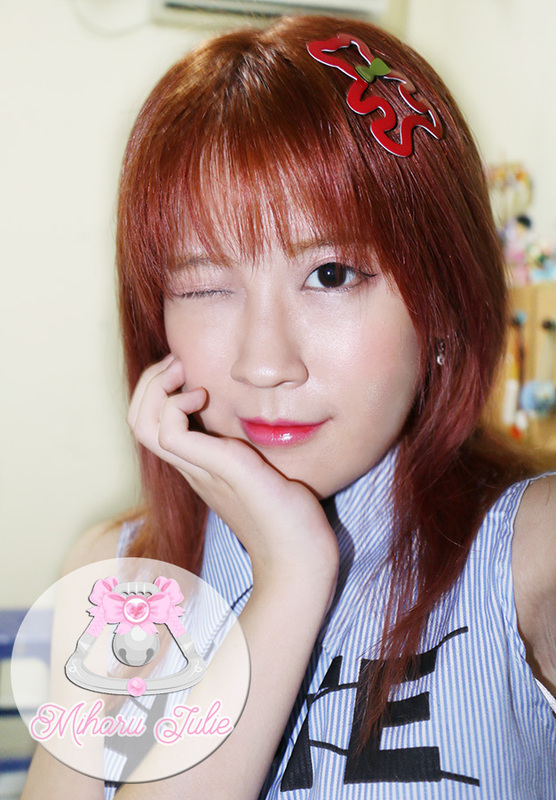 You have the chance to win a pair of circle lenses. 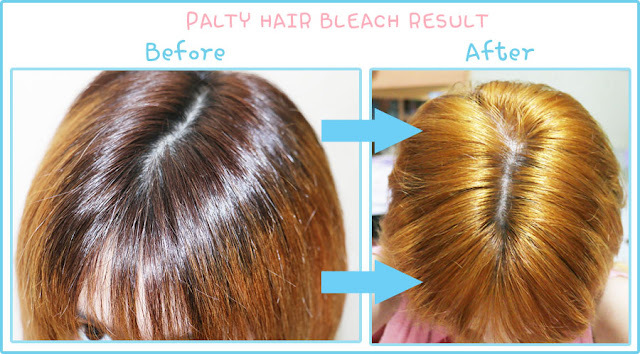 Palty is better than loreal hair dye. Really beautiful, I like it! 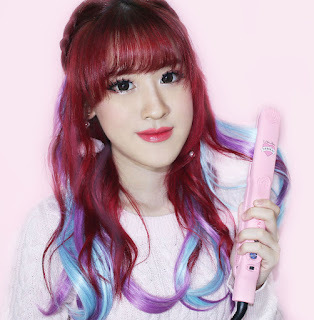 Que lindo que ficou seu cabelo, adorei o produto que usou. That's a really cute hair colour shade! I always see those but never end up trying them. I love the result, it looks great on you! Love your hair! You look adorable! Wonderful tutorial change hair color. Wonderful review and great product! Gorgeous end result, really cool. you're fine with this color!